The New Zealand Ministry for the Environment’s LUCAS (Land Use and Carbon Analysis System) Project has achieved an exceptional placing, being one of the 4 finalists out of 16 in the Government’s ICT (information and communications technology) awards held in late October 2009. The Hewlett-Packard sponsored awards highlight excellence in the development of ICT applications within the New Zealand public sector. The LUCAS Project was developed to house a broad spectrum of New Zealand’s land use information. This information is ultimately required to help the New Zealand government meet domestic and international reporting requirements for land use and carbon accounting. The Geospatial component uses satellite imagery to classify and produce land use maps of NZ in 1990, 2008, and later in 2012. 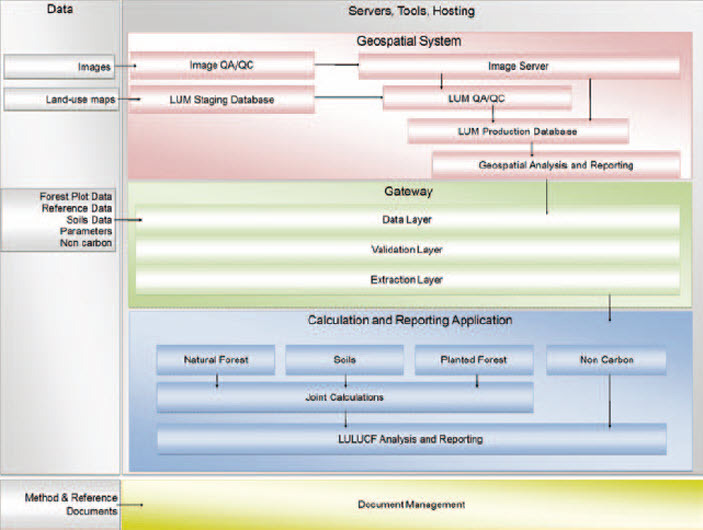 It is based on the ESRI ArcGIS platform. The Gateway component stores biomass and soils data captured from plots located throughout NZ’s natural and planted forests. The Calculation and Reporting Application (CRA) component brings together the Gateway and Geospatial datasets to establish estimates of carbon for reporting on New Zealand’s commitment to the Kyoto Protocol and UNFCCC (UN Framework Convention on Climate Change). Interpine has been working alongside the Ministry for several years on various elements of the LUCAS project. More specifically, Interpine played a critical role in the development of the Gateway and the CRA components. These two applications form part of the “LUCAS Management Studio”, which when partnered with data from the Geospatial component provide the relevant tools for NZ to meet its international reporting requirements for carbon. Interpine’s core development team, consisting of Dr Hamish Marshall, Brian Rawley, Esta Chappell, Charles Chikono, Steven Roberts, Will Goudie, Matthijs Borst, Jonathan Dash, David Herries and Richard Wilson, have all worked diligently, intelligently, and with an added level of passion to deliver a product that Interpine is proud of. The ICT award is further confirmation of the quality achieved by the combined team effort of the LUCAS staff and the Interpine development team working on the Gateway and CRA applications.